Last day of term at our school, and Dress Up As A Book Character Day. My delightful daughter has a box full of dress-ups and a PaperBag Princess costume left over from pre-primary, but no. She wanted to be Snow White's nemesis, the Wicked Queen. 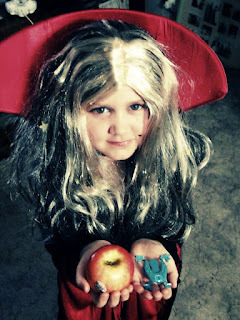 Here she is with her 'familiar' (a blue frog) and a poison apple (complete with sticker). This is the second attempt at a poison apple -- her brother ate the first one. So far he's not showing any side effects, but time will tell. It was interesting once we got to school, seeing all the different costumes. There was the usual collection of Harry Potters and Star Wars characters, but I noticed a LOT of fairy tale people this year. We spotted Red, Rapunzel, a couple of Prince Charmings, Snow, Cinderella, and of course my little Queen. And I think it's because Once Upon A Time is showing on tv at the moment. It seems the old-fashioned fairy tale is making a come-back. I've read the arguments against fairy tales, especially those by the Brothers Grimm. They're bloodthirsty, they are filled with tales of fractured families and abandoned children, tales of murder and cannibalism and dark magic, and they're too scary for kids. Maybe they are. But I grew up reading them, and I loved them as a child. I didn't have nightmares about fairy tales at all. Maybe that was because I had more real, actual problems to worry about, or maybe it's because kids are better at understanding stories than we give them credit for. There is something in all of us that likes a little frisson of fear. How much is up to each individual -- we might like to watch a scary movie, but balk at sky-diving. Humans are built to enjoy exploring fears and phobias, as long as we know that someone is in control. As adults, it's us -- we can turn off the tv or close the book (or laptop) or not go on that ride. For our children... well, it's still us. We are the Grown-ups, their hedge against monsters and witches and things that go bump in the night. Stephen King has a wonderful passage in his book, It. "It was story hour, and over in the corner a group of roughly a dozen little ones sat solemnly on their tiny chairs in a semicircle, listening. Some of the children covered their mouths and giggled, but others only watched her, their eyes reflecting the eternal fascination of the fairy story : would the monster be bested..... or would it feed?" As a mother, I want to do the very best for my kids. I don't want to wrap them in cottonwool and coddle them and protect them from all manner of nastiness. My kids understand failure is not the end of all things -- it's an opportunity to learn and start again. They know that beauty is not the yardstick we should measure others by; they know that fair is getting what you need to succeed, not having everything handed to you on a plate. They know that to get ahead in this world, you have to work hard and treat others well and that sometimes you'll get taken advantage of but that doesn't stop you from doing what you know to be right. And they know that there are dark things in the world, and we need to help each other out to get by. I'm not in favour of fairy tales being sanitized. I'm not in favour of the scary bits being censored. But I do think it's up to each parent decide if they want their OWN child to read scary stories. After all, who knows YOUR child better than YOU? Certainly not me. Wow, she looks great!! I love her hair. As for fairy tales, I believe the reason they resonate with so many is that, like all great myths, they are telling archetypal stories -- ones that are common across all cultures because at their heart they are very basic human experiences. Loss, betrayal, love, traveling from innocence to maturity, etc. You can't sanitize life (unfortunately). Why sanitize fairy tales? Though wouldn't it be great if we could re-write our lives and give them all Happily Ever After endings? WHAT AN AMAZING "wicked queen" !!!!!!!! HAHA you should have seen her Evil Smile! she was hilarious. "maybe it's because kids are better at understanding stories than we give them credit for." Yes, they are. I've been saying that for years. If you know your child can't handle these stories, then don't read them until they can. But don't be sanitising, or censoring them. If we constantly wrap our kids in cottonwool, how will they learn to cope with real life? I think your daughter is a great wicked witch!! She certainly LOVED the chance to be WICKED and get away with it! Fairy tales are fun and magical (even if the magic is sometimes at the hands of an ugly evil witch). But they all turn out ok in the end which I think is a pretty good message of resilience, hope, perception and perseverance. 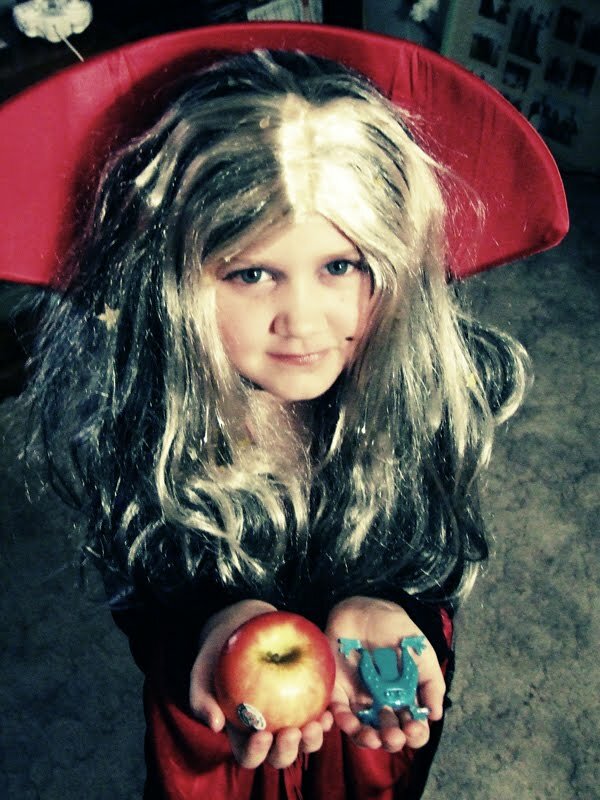 Great photo of your little witch. Love it! I wish we had more mummies and daddies like you and Fabio - because life is a goddamn scary story, very often without a 'happy ending'. K&J are so much more skilled for the reality of this world BECAUSE you let them read old fashioned Fairy Tales. sneezing and snobbles and coughs, oh my. how's YOUR week been so far? are these YOUR fingerprints, Miss?